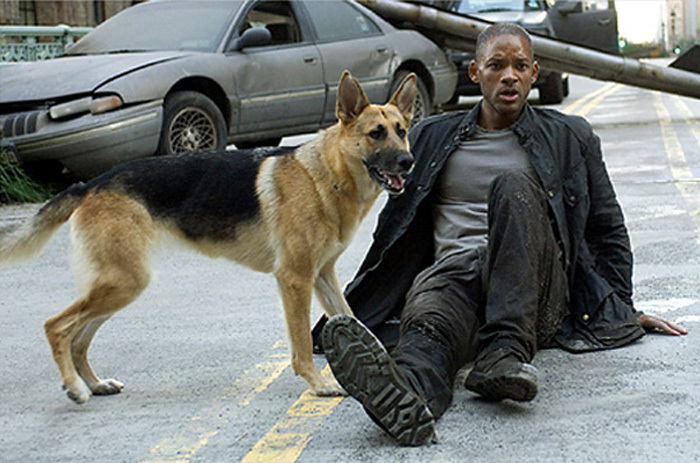 When it’s just Will Smith, a dog and a near-deserted Manhattan, the film is surprisingly enjoyable for someone like myself who rarely goes to gazillion-dollar summer blockbusters² (the genre, despite its mid-December release, into which I AM LEGEND seems to fit at a glance). Smith plays the last man on earth — the remaining homo sapiens having either died from a virus created as a cancer treatment or been turned into flesh-eating beasts who disintegrate in the sunlight. He puts out signals for remaining humans, tries to find a cure and rents videos by day, when it’s safe. The great pre-credits scene was so economical in setting up the story premise and the setting, that it put me in mind somewhat of Michael Haneke, who made a similar-in-premise film in TIME OF THE WOLF. Director Francis Lawrence uses downtown Manhattan mostly as negative space (like in this photo) and of darkness, at once isolating and oppressing Smith — an unusual strength for a music-video director. Indeed, not until afterward did I realize I was basically watching a vampire movie. There are moments of shocking recognition and existential loneliness, like Smith in a video store, that you don’t see in splosionfests but mark I AM LEGEND as something different. For most of the movie’s length, Smith only has a dog and mannequins to relate to, but he does a magnificent job of portraying half-sanity, half-insanity without obvious “cue/switch” moments. He feeds his social nature as man in the only unsatisfactory and unnatural ways available, like Chaplin making a gourmet feast out of a shoe. Smith is the film, really; and I hope AMPAS and Skandie voters [PLUG] remember him. My favorite moment was from this scene, where Smith has just escaped a trap but fallen on his knife and stabbed himself — while his dog, relieved to see him, licks up a storm on his face. The contrast among the dog’s joy, Smith’s agony, Smith’s keeping face and the objective threat of the moment is brilliantly achieved. And who ever thought you’d see an action scene in which the chief protagonist is a sunset? Indeed, other than the Gradually Expanding Flashbacks of Smith evacuating his family, I AM LEGEND never steps wrong in its first hour (the scenes are fine in themselves, but the cliched structuring device is not). But then it does. ¹ Actually, not really. The start isn’t a 10 and the end isn’t a 0, but it did work out that way. ² I only went to see I AM LEGEND because I owed a friend. My alternative, given what was playing after 11pm, was ALIEN-v-PREDATOR 2.